My word she’s value, that AJ! This week we brought Amanda back for a Q and A session with question coming from… well, mostly us. That paucity of questions says a number of things, first, our preparation might not have been as good as it might, and we didn’t ask you the right questions ourselves..
…but then I’m currently living without internet at home which makes getting this sort of thing done even more of a challenge than normal. But actually, it could speak more to the idea that once fans have been wronged or mistreated, all they want to do is forget about it, and often they do. So we looked at that possible phenomenon of apathy in fan culture, and then had a look at how in recent weeks certain groups of fans have had some pretty draconian treatment on their travels. We’re not sure this entirely fair, but by purchasing a ticket you agree to the clauses as described there, which is frightening. So we discuss that, and some other issues surrounding some ‘interesting’ treatment of travelling Birmingham and Portsmouth fans as well. Chris Roberts takes us on a Tour of The Old Spotted Dog ground, and David Stubbs finishes the show off with aplomb by going nuts, as per. 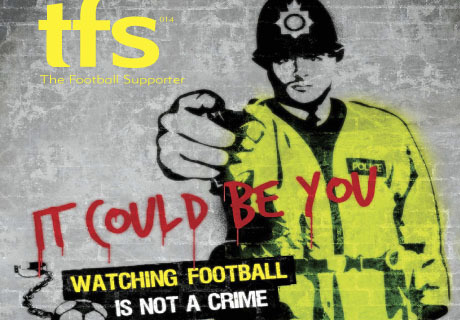 There’s no need to put up with ANY mistreatment simply for attending a football game; it’s NOT a crime. If you do, speak out, complain and complain to Amanda. She knows people that can help.